Liam Rosenior says it’s important to move on from the disappointment of last season and prepare for another push for promotion. The 31-year-old utility player admitted missing out on promotion – on goal difference – was the hardest thing he has had to deal with in his career and there were numerous ‘what if’ thoughts which went through his head over the summer. 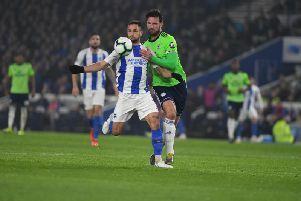 However, he says Albion have to use last season’s disappointment as their motivation for the upcoming campaign and said: “For sure, I thought about what ifs over the summer, it’s human nature. “When you come so close to doing something so big, not just big for the club but for the whole area, you do think if there had been two goals here, if we’d just scored a goal here or if we’d not conceded there but it’s gone now. “We’ve got to move on and this is a true test of how we are as people. Do we go one way and say it’s not going to be our year or do we say all right, we’ll go one better and show the resilience that’s within the group and the club. Rosenior knows the Championship will be competitive again and said: “I say it all the time that it’s the hardest league in the world. I’ve played half of my career in the Championship and half in the Premier League and playing in the Championship is so hard. On whether there will be more pressure on the team this season after an impressive campaign last time out, Rosenior said: “We put a lot of pressure on ourselves to achieve. We have our own targets that we want to adhere to and get to and that was to get promotion last season, so we put enough pressure on ourselves but, in saying that, I think teams’ perception of us will be different this year. “I think we’ll be more of a scalp for teams and I think teams will have more respect for us, especially when we’re at home. I think they will come and sit back a little bit more and let us try to break them down. Rosenior feels a trip to Derby County on Saturday is a good way to start the new season and said: “It’s a really good start for us because they’re one of the teams that I think will be fighting for promotion as well.